Once a bank account number has been entered into Jackrabbit, only the last four digits are visible to users. It is NOT possible to see all digits of a bank account number due to PCI Compliance regulations. Add the Bank Transit # and Institution ID. Enter New Bank Acct# and Save. Choose an Account Type from the drop-down list. Add an Account Name (Name on the Account). On the Billing Info tab, set ePayment Method to Bank Account. Save Changes. The address associated with the bank account information is taken from the contact who has Billing Contact set to Yes. The Family record MUST have a telephone number in the Home or Primary Phone field on the Summary tab in order for the Bank Draft to be accepted by the gateway. This phone number is not populated when the Contact phone number is added, it must be added separately. If your organization accepts both credit cards & bank accounts, and a family has both a credit card and bank account on file on the Billing Info tab of their Family Record, the ePayment Method field determines whether the bank account or the credit card will be submitted for payment. If you are using Online Registration, you can require your families to enter bank account information at the time of registration. Learn more about Online Registration. 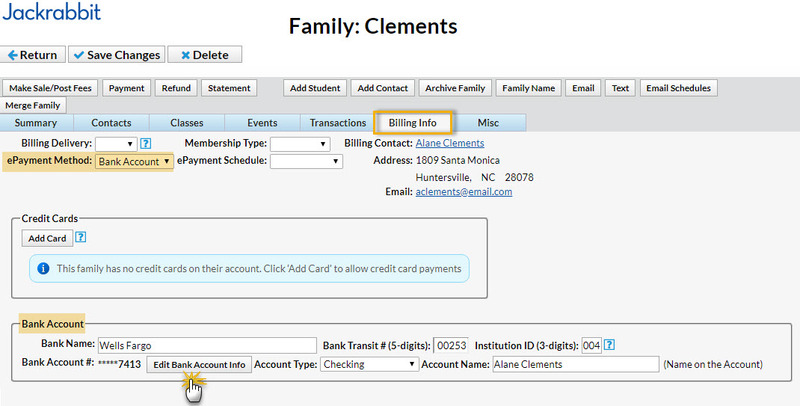 If you allow families to add or edit bank account information while logged into their portal, see Parent Portal ePayment Settings for details on adding and editing bank accounts in the Parent Portal.